Holley's newest brand, Anvil Off-Road, has released a host of new products. 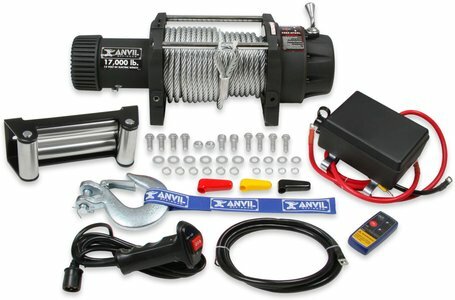 Now available are 17,000-pound, 12,000-pound, 9,500-pound, and 4,500-pound heavy-duty electric winches; a complete line of service parts and accessories; and a multi-piece accessory kit packed with exactly the items off-roaders need most. 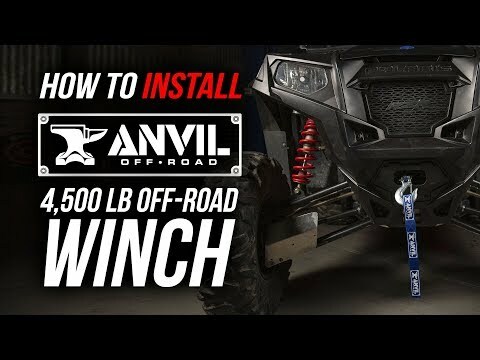 Anvil Off-Road heavy-duty electric winches deliver the maximum pulling capacity required for 3/4-ton trucks, 1-ton trucks, and equipment trailers. 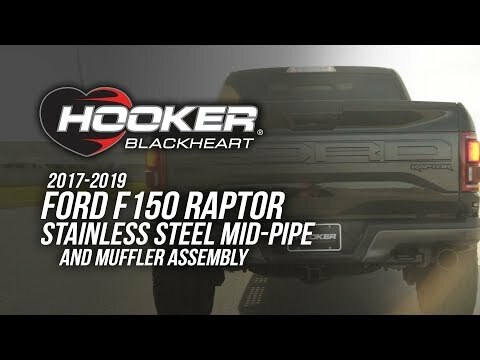 They're powered by 7.0 horsepower 12-volt motors and come with your choice of a metal cable with a four-way roller fairlead or a synthetic rope with a billet aluminum fairlead. 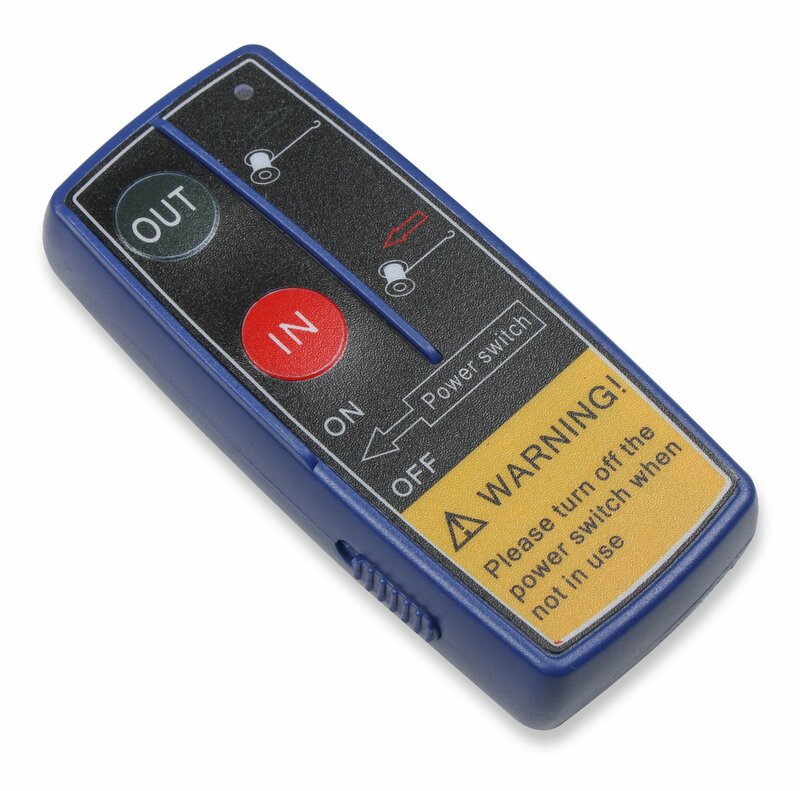 The included wireless remote control is a huge help when pulling a truck or any heavy vehicle on an equipment trailer. 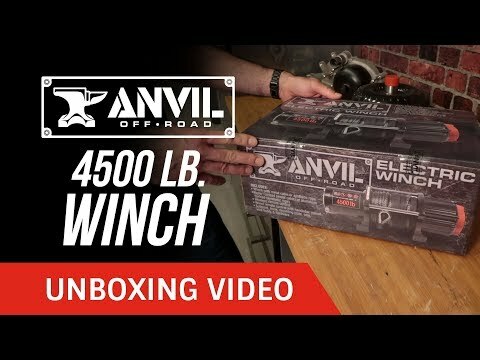 Anvil Off-Road heavy-duty electric winches deliver massive pulling capacity and are ideal for use on Jeeps®, trucks, and trailers. Powered by your choice of a 5.5-horsepower 12-volt motor (9,500-pound pulling capacity) or a 6.6-horsepower motor (12,000 lbs. ), both versions are available with either a metal cable with a four-way roller fairlead or a synthetic rope with a billet aluminum fairlead. 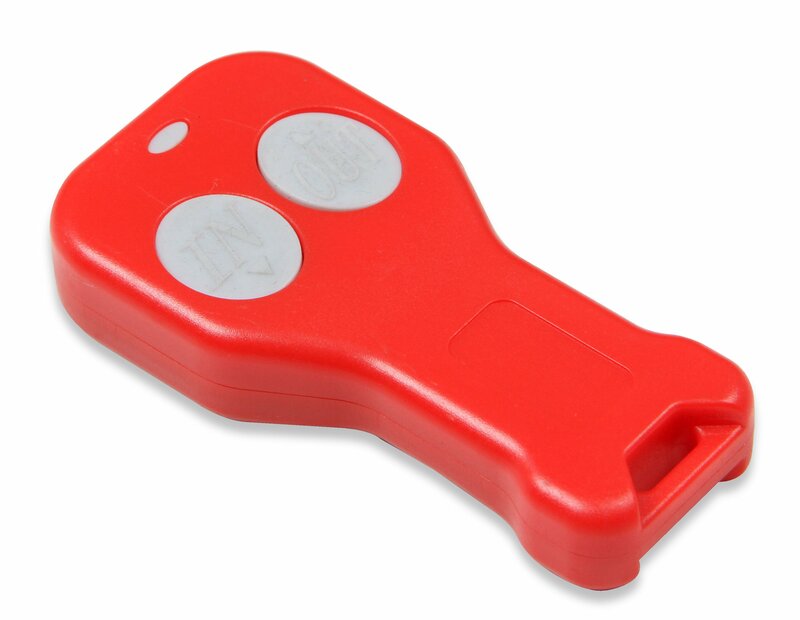 The solenoid comes pre-mounted to the top of the winch and has its own protective cover, and the wireless remote is invaluable when loading a vehicle on a trailer or anywhere it would be difficult to reach a wired switch. 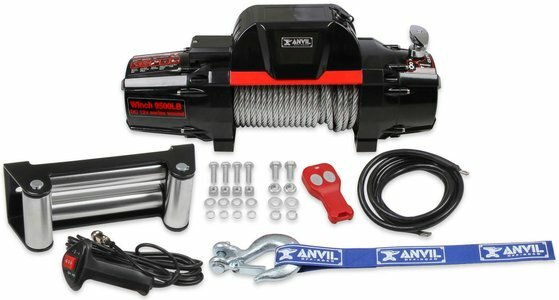 Anvil Off-Road 4,500-pound winches provide more than enough pulling capacity to handle ATVs, UTVs, and car trailers. 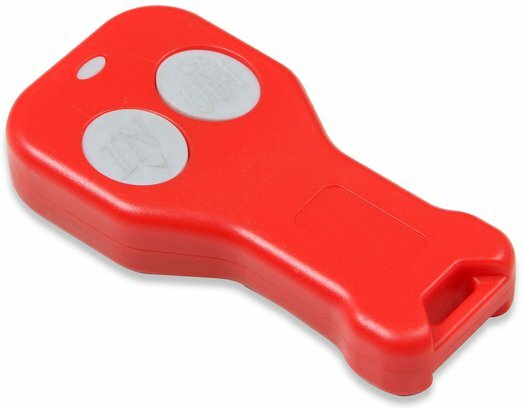 Powered by an efficient 3.5-horsepower 12-volt permanent-magnet motor with a three-stage planetary gear, they come with your choice of a metal cable and a four-way roller fairlead or a synthetic rope with an aluminum hawse fairlead. The wireless remote is perfect for loading a vehicle on a trailer because it allows you to steer the vehicle with one hand and control the winch with the other. 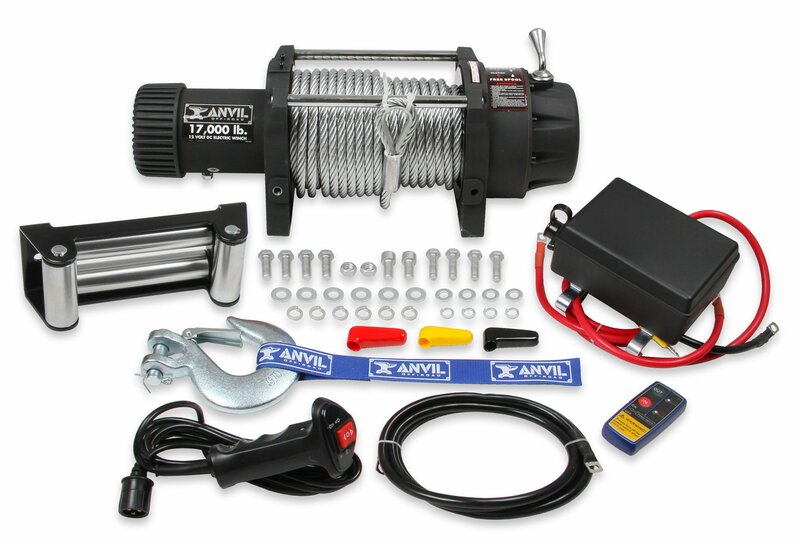 To service your Anvil Off-Road winches, a huge assortment of replacement parts and accessories are available. 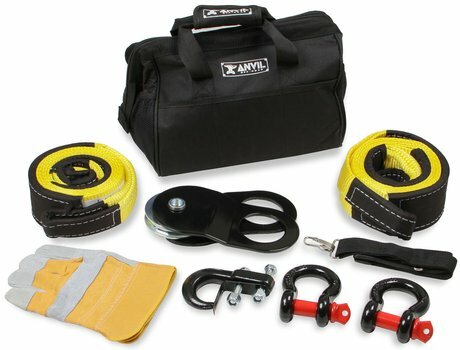 Numerous components are offered on their own as replacement parts: wireless remote controls, winch-mounting plates for two-inch receiver hitches, bow-shackle receivers for two-inch receiver hitches, battery quick-disconnects, tree saver/tow straps, winch hooks, four-way roller fairleads, aluminum hawse fairleads, bow shackles, synthetic rope, pulley blocks, winch covers, nylon hook handles, license plate mounts, roller fairlead covers, even an eight-piece accessory kit with its own storage bag. 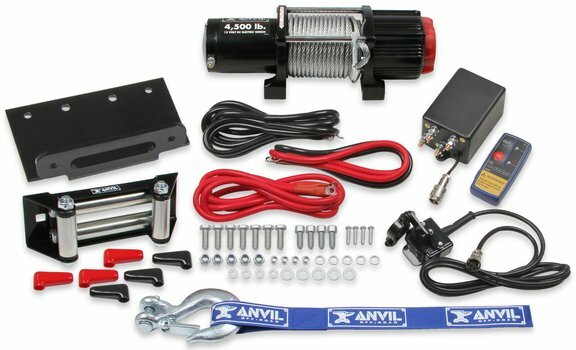 Anvil Off-Road accessory kits are packed with not just a nice array of accessories but the exact pieces you're most likely to need. 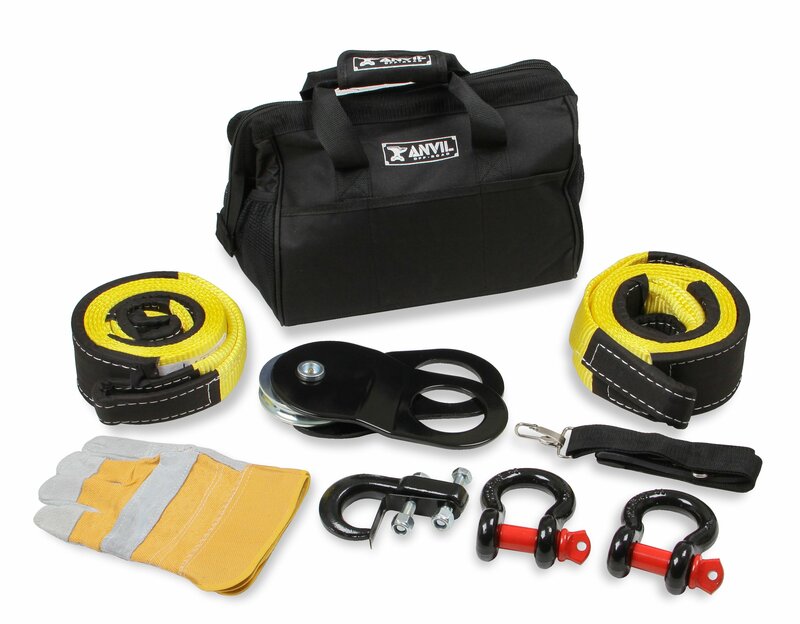 Included are the most common recovery accessories necessary to get you out of a bind and back on the trails: two 10-foot tree saver/tow straps, two 3/4-inch bow shackles, a pulley block with a grease fitting, a tow hook, heavy-duty gloves, and a tough, durable bag to store them all in. 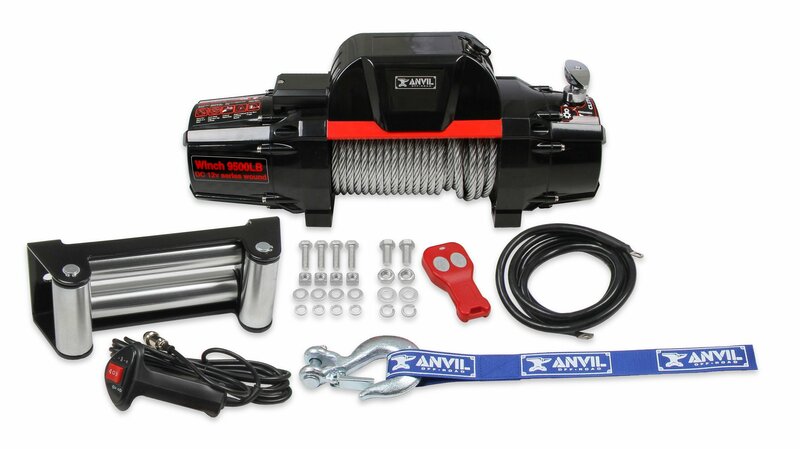 See detailed product information for Anvil Off-Road's complete line of electric winches. See detailed product information for Anvil Off-Road accessories & service parts. 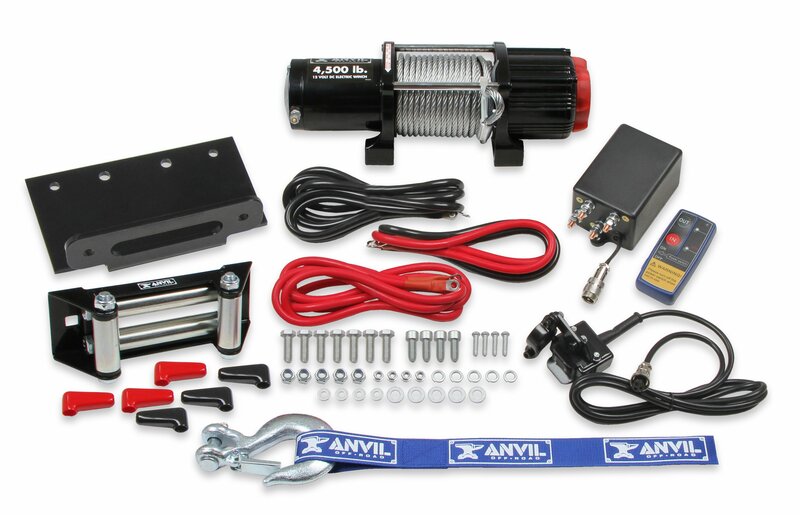 See detailed product information for Anvil Off-Road accessory kits.